The old saw is that if March comes in like a lion, it goes out like a lamb; in like a lamb, out like a lion. Hah! This year’s a fooler. March came in like a lion and is leaving like a lion. I awoke this morning to about an inch of snow on everything. In the dark, when I’m walking, it’s a study in black & white. Aesthetically quite beautiful – every little branch, weed, and rock is covered in snow. 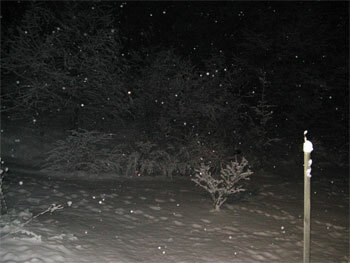 It’s relatively warm, so the snow is wet & heavy, but not so heavy that I’m worried about it doing lots of tree damage. And it’s warm enough that my walk is reasonably pleasant. Still, it is March 31. Although I don’t have any photographic evidence that March 1 was lion-like in its weather, I’m sure it was. I’ve lived here in western New York all my life, and I know it’s not unusual for us to have snowfall, and even snow storms in March, and April. (In fact, my mother documented flakes falling one frigid Memorial Day weekend about 40 years ago, but that’s another story.) What IS unusual is the continued cold temperatures so the snow never leaves. I also think that the majority of my garden plants will be just fine. They’re much more likely to come through a loooooooong stretch of freezing temps if they’re consistently protected by a thick blanket of snow. It’s much more difficult for them when they freeze & thaw, freeze & thaw. 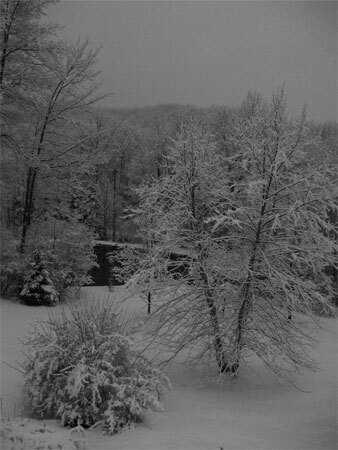 So I’m simply going to enjoy the Currier & Ives look this morning, and not lament another snowfall. Your turn: what’s positive about the weather where you are? Great photos, Peg, especially the predawn shot! My place looked equally lovely.This afternoon 7 deer spent an hour in my back yard pawing the snow aside to find the yummy grass. Thanks, Margaret. You do have a great yard to see deer, turkey, vultures, fox, and other wildlife!